Fact: I love makeup and beauty products. Fact: Makeup and beauty products can be expensive. Fact: Makeup and beauty products hardly ever go on sale…so when they do, stock up! I love Sephora’s friends and family sale (20% off your purchase between now and November 11 with code vibtopia. purchases over $50 ship free and fast. ), and I love the fact that it coincides almost perfectly with my birthday. 2 Sephora birthday gift cards are waiting to be used towards the products I’ve been holding off from buying until now. l’occitane. a skincare line I absolutely adore for their wonderful history, divine scents, and natural ingredients. I’m partial to their amande line with the moisturizer and shower oil already in my coffers. I’ve been trying to try the supple skin oil for an almond oil trifecta skin regime. their soaps are also amazing – super moisturizing, super gentle. nars cinematic lipsticks. these supposedly have a new, light, non-pulling formula. I’m already a fan of the current lipstick line, so if these are even better than that, I’m sold. future red is a perfect cherry red and full frontal is a unique rose violet. nails inc. polishes. highly recommended by several of my friends, I can’t wait to test out the thames, a moody dark grey, and porchester square, a more tranquil soft grey, on my tips. fresh sugar rose royalty set. I was originally just going to purchase the sugar rose lip treatment, but when I saw this kit and realized that not only did it include a full size tube of the lip treatment but also a good-sized tube of their soy face cleanser for only a little bit more moolah, this made the cut instead. I’m a fan of the lip treatment in various shades, but the rose is my favorite. sephora ultimate moisture serum. most of the products I’ve picked so far have been on a “moisturize and pamper your skin” theme, and this one is no exception. I’m hoping this keeps dry patches on my cheeks at bay when used in a 1-2 preventative punch with moisturizer. jack black. these products are actually for james, who I’m trying to ease into a skincare routine. he and I are both big fans of the lip balm, so I figured this line would be a good place to start for the basic 2-step skin regimen: cleanser and moisturizer. 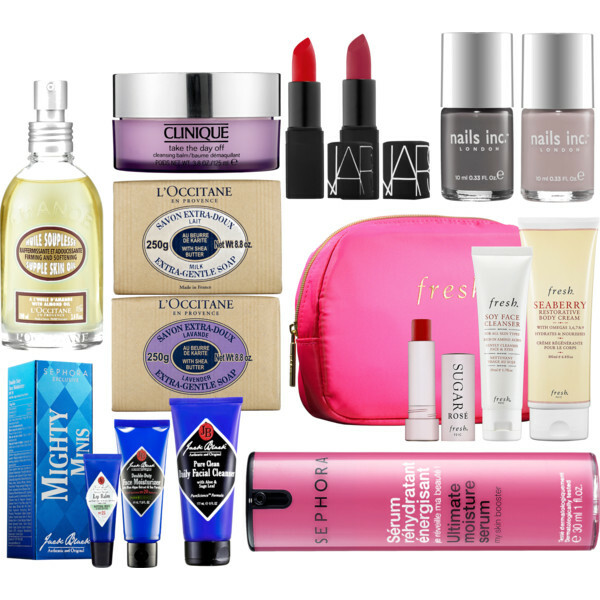 Are you shopping the Sephora friends and family sale? I’d love to know your picks (I’m nosy like that. ;) ).